PrestaShop vs Shopify: What to Choose? Choosing ecommerce platform is the most fundamental decision you should make before launching a webstore. Of course, it is possible to migrate from one platform to another, but do you really want to spend time and money doing this? It would be much wiser to explore the question, look into the distinctions between platforms and only then make a choice. 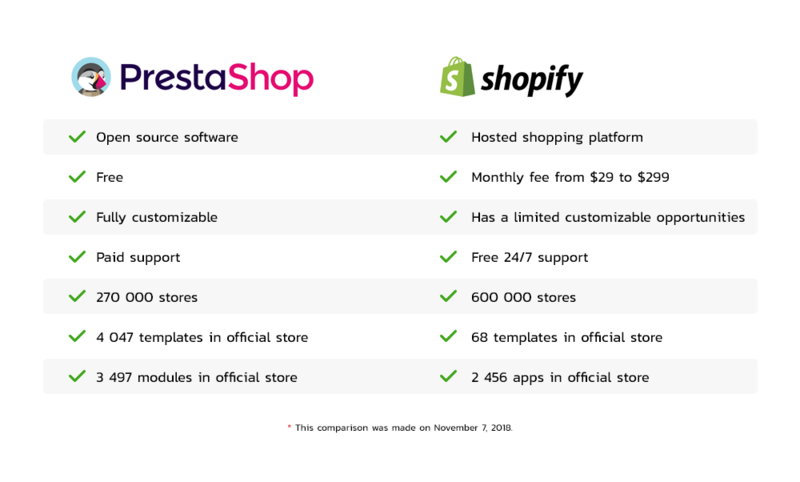 To facilitate the task let’s overview and compare two popular platforms: PrestaShop and Shopify. PrestaShop is one of the most famous and popular ecommerce platforms in Europe. The company entered the market in 2007 and today more than 270 000 online stores use it, while the PrestaShop community consists of over 1 million members. This open source solution released its 1.7 version some time ago and now merchants have a lot of opportunities to make a webstore they want. PrestaShop has more than 200 official partners in 51 countries and a marketplace where merchants can choose themes or modules to customize an online store. Cost. PrestaShop is free open source ecommerce software. It means that your PrestaShop-based webstore will be fully customizable and you can add any feature you want. Usage. The PrestaShop dashboard is clear and easy-to-use. Webstore owners can manage the shop without any additional knowledge or technical skills. Customer support. The platform has a big community, a forum and a wide range of partners all over the word that can solve any technical problem. PrestaShop has its own support team and thus their services are paid: from € 249 to € 1 399 depending on a chosen plan. Designs. There are more than 4 000 themes both free and paid at the official PrestaShop market. You can choose whatever you want depending on platform version, shop category, style and included functionality. Even so, you can always create a theme from scratch on your own or with the help of developers. Modules. To extend the standard functionality you can use one of the multiple PrestaShop modules or again create your own. Modules are intended to upgrade your webstore, increase traffic and improve customers shopping experience. Shopify is a well-known ecommerce company from Canada. During its 15 years of working the company grew from a small project of 3 friends to a famous company with 3 000 employees. Nowadays 600 000 businesses use it to sell online. Pretty impressive, isn’t it? Shopify is supposed to be the perfect decision for beginners, as it is a hosted shopping platform. It means that webstore owners cannot access the code itself, but they still have an opportunity to control the HTML and CSS of the site. Cost. Shopify has a free 14-day period and several pricing plans. You can choose one that is better for you: Basic for $29 per month, Shopify* for $79 and Advanced for $299. Usage. Shopify is very simple to use. Its drag-and-drop interface was developed specially for beginners in ecommerce. Customer support. Shopify provides 24/7 customer support for their clients. Moreover, community, forum, video tutorials and webinars can also be helpful. Designs. Official Shopify market has less than a hundred themes. But you can always find a developer to create your own theme. Add-ons. Shopify has tools available for growing ecommerce business, but their number is not as big as the number of tools offered by PrestaShop. Differences between the platforms are more clear when presented visually. Let’s take a look. As you can see, both platforms have their pros and cons, but they both are a good choice. Their main difference is the size of target ecommerce business. Shopify is ideal for small businesses, while PrestaShop will work well with medium and large ones. As webstore developers we work with both Shopify and PrestaShop platforms. And our main advice is to look carefully at your ecommerce business and its opportunities and only then make an informed decision. Maybe you will even choose the third platform after diving into this topic. By the way, we have already made Magento and Shopify ecommerce platforms comparison. Good luck in creating your online store!